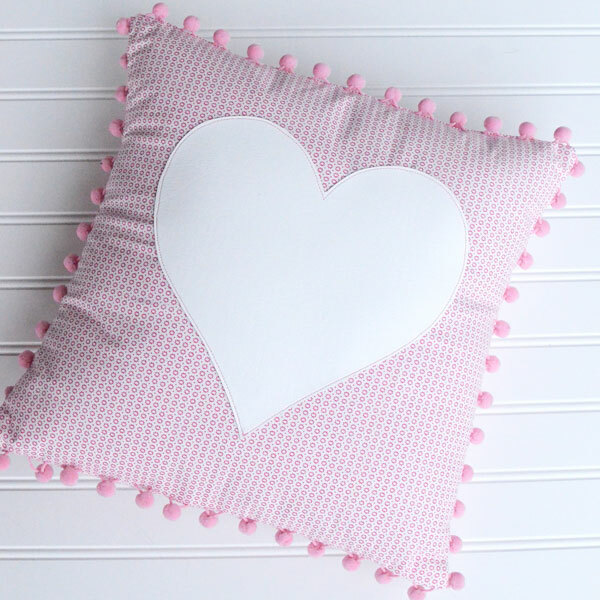 Pom Pom Heart Pillow Tutorial - Perfect for Valentine's Day! 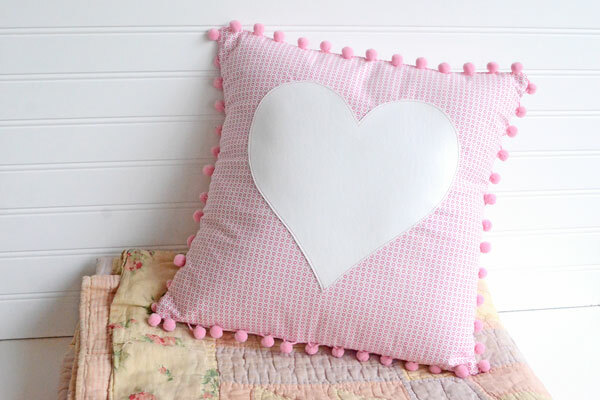 This lovely pom pom heart pillow tutorial is a perfect decoration for Valentine’s Day, a little girl’s room, or anywhere at all! So cute!! I’m not too big on Valentine’s Day as a romantic holiday, but I sure do love the idea of a holiday just for telling folks you love them. And I think decorating for Valentine’s Day is a lot of fun! I think it’s because all the Christmas decorations have come down, and the house is feeling plain and the weather is still dreary. And then Valentine’s Day gives you an opportunity to make things happy with hearts and pretty pinks. 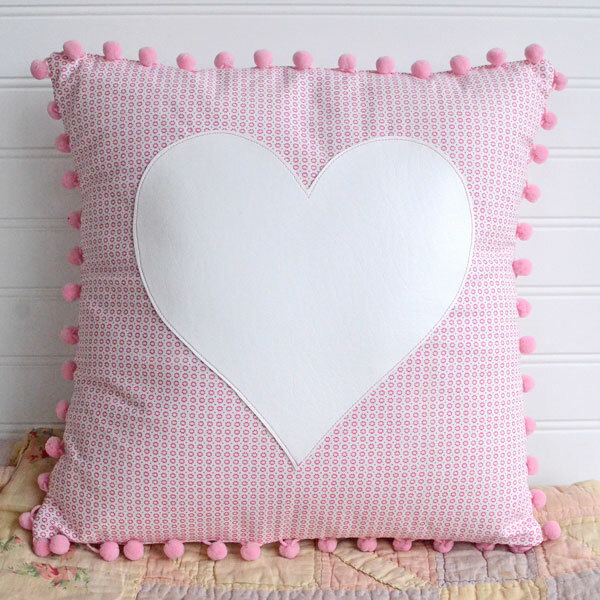 This pom pom heart pillow makes a cute Valentine’s Day decoration for a porch swing or entry way bench. But it would also be a sweet year-round accent for a girl’s bedding set. 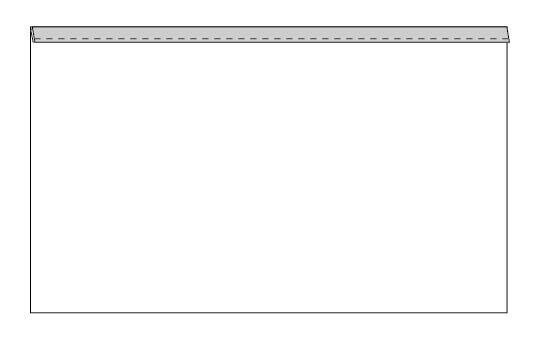 I’ve got a tutorial for you below. The vinyl heart applique makes a bold statement, while the pom pom fringe gives it a vintage feel. I sewed mine up in a soft pink and white, but it would also be cute from bold fabrics – even some bright florals. It’s quick project to sew! Even if you’re a beginner you can make it start to finish in one evening. A more confident sewist could make it in an hour or so. 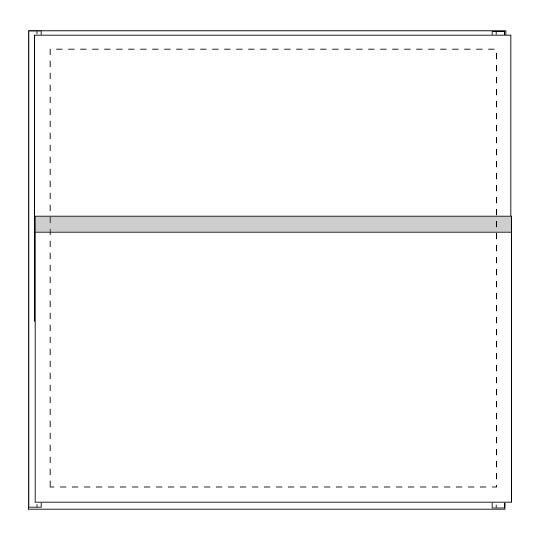 The envelope closure on the back of the pillow cover is so super easy – no zippers, no buttons. BOOM. And if you’ve never sewn pom pom trim before, this is a great project to give it a try! I promise you’ll be hooked. Pom pom trim on everything!! 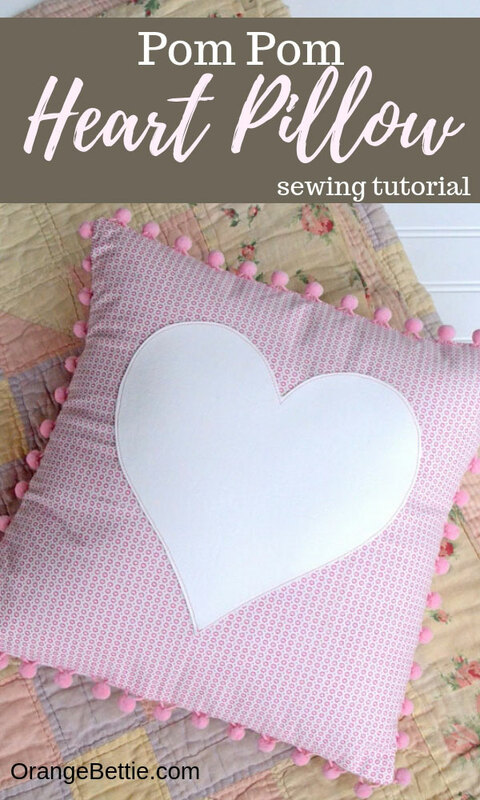 Fuse the interfacing to the back of the Pillow Front. Center the vinyl heart on the Pillow Front. 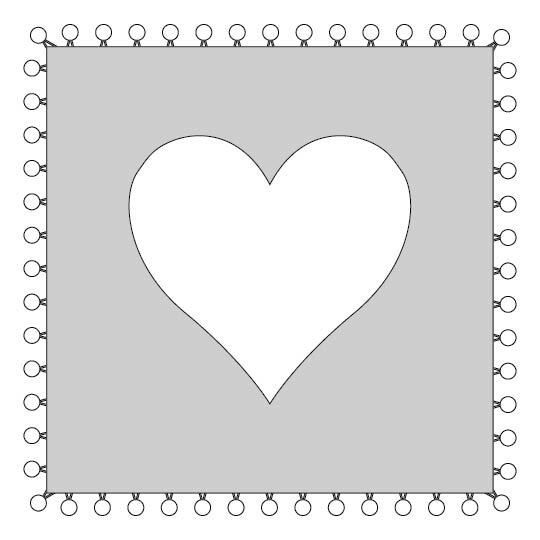 The top/bottom of the heart should be 3 ¼” from the top/bottom of the Pillow Front. 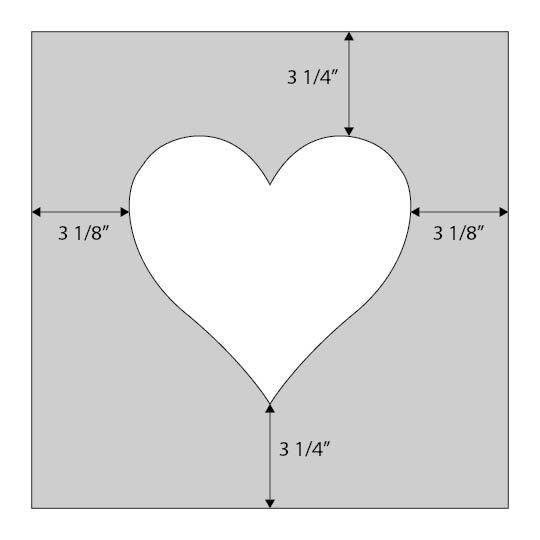 The sides of the heart should be 3 1/8” from the sides of the Pillow Front. 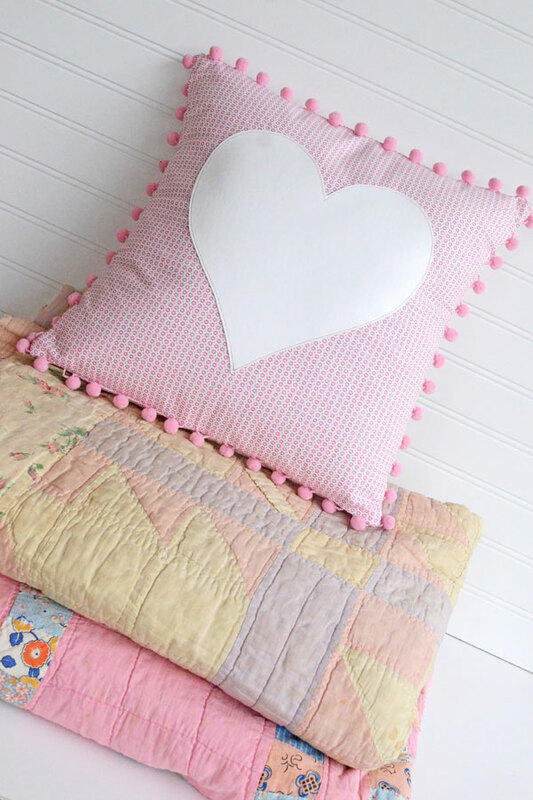 Tip: Mark the center of each side of the Pillow Front with a small notch to make it easier to center your heart. 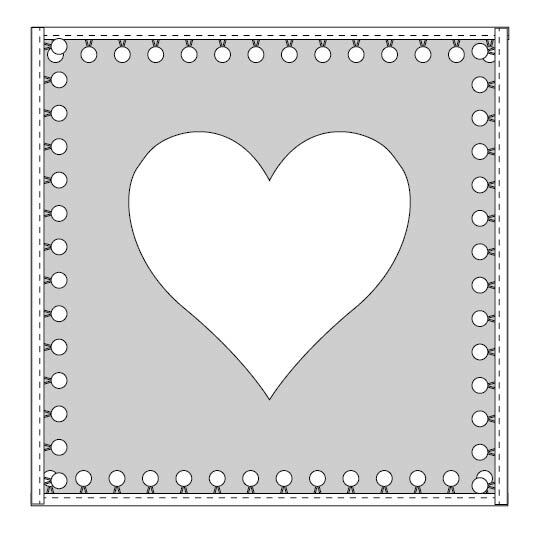 Glue baste the heart down with glue stick or fabric glue. Try to keep the glue from getting too close to the edge so you don’t have to worry about stitching through the glue later. 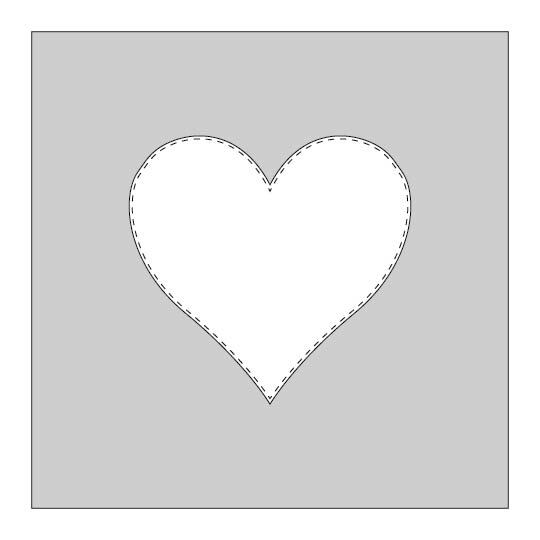 To make extra sure the heart doesn’t drift or twist while stitching it down, use some masking tape to further secure the heart to the fabric. Set the Pillow Front aside to let the glue dry. Take one of the Pillow Back pieces and press ½” to the wrong side of the fabric down the long side (15”), and then fold another ½” to create a double fold hem. Stitch the hem in place close to the folded edge. Repeat with the second Pillow Back piece. 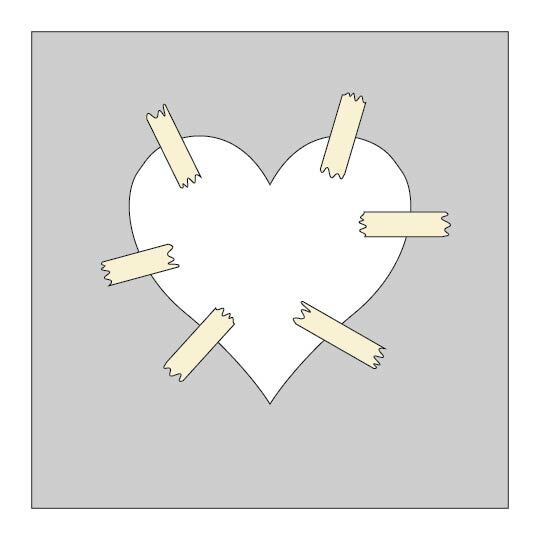 Now that you’ve given the glue some time to dry, let’s stitch down that heart. Stitch around the heart close to the edge (1/8” seam allowance), removing the tape as you go. I used a contrast thread but that’s optional. Vinyl tends to stick to the bottom of the presser foot. To prevent that from happening, use a Teflon presser foot or cover the bottom of your presser foot with tape. Now, with a zipper foot baste the pom pom trim to 4 sides of the Pillow Front, with the edge of the pom pom trim even with the raw edge of the fabric and the pom poms facing the inside. Rather than trying to wrap the pom pom trim around the corners, I just cut the trim at the corners and basted each side separately. Now, take those Pillow Back pieces you hemmed and place them on top of the pillow front RST and with raw edges aligned. 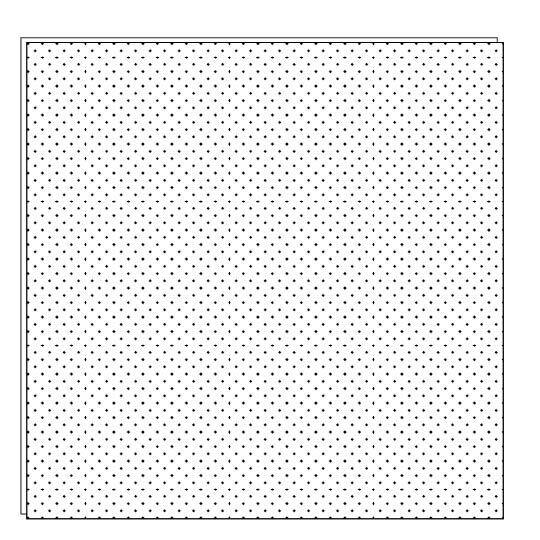 The hemmed edges should overlap at the middle. The pom poms are bulky so use lots of pins to keep the fabric from shifting. Stitch around all four sides with a ½” seam allowance. Clip corners and turn right side out. If you need to press your pillow cover, be sure to avoid touching the vinyl with the hot iron. Insert the pillow form into the cover. Your heart pom pom pillow is done!